Vegemite: Brekkie of Champions!!! | blarg! 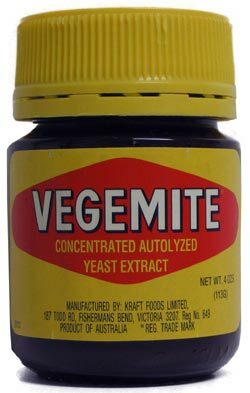 Of course, I have been aware of Vegemite for many years, as well as its English inspiration, Marmite, but I had never tried it before a few days ago. I had always heard from Americans that it was salty and awful, but a great many Brits, Aussies, and Kiwis enjoy such things as their default breakfast. Despite the fact that I have a soft spot for the tastes of other English-speaking countries (Weetabix, anyone? ), I guess I just didn't think that something described as "yeast extract" could be anything but nasty. I probably would have gone to that great big breakfast buffet in the sky having never tried Vegemite if it weren't for an article I can't find now that laid out the ideal set of meals for maintaining optimal brain function throughout the day, and Vegemite was listed as the best breakfast you can have. ...and gagged. I couldn't even swallow the first bite. I spit it into a plastic bag with the toast so that it couldn't taint the other trash and threw it away. I decided to return the vile substance to whence it came in the form of shoving it at Jack, my Aussie friend and coworker, in front of a gaggle of giggling students. "Return this to your people," I proclaimed, sliding the jar across the table, "with my utter contempt and condemnation!" "Did you try it with butter?" "You have to have it with butter or it tastes like crap. And don't put too much on." He slid it back across the table. I took it back home. This time I made the toast, spread the butter, and applied a very thin layer of Vegemite over the top. The saltiness, which was at first overpowering, was now simply pleasant. The earthy bitterness mixed with the fat of the butter to make a kind of delectable sauce. I finished the piece of toast. I had another. I spoiled my dinner with Vegemite. I had it again this morning. I just can't get over how delicious this is. It's stunning how different it tastes with the addition of butter. I'm going to try it with cheese next! So, to my fellow Americans: Fear not the strange brown paste of our colonial brethren! It is not only healthy, but deee-licous! Vegemite: The Brekkie of Champions!